There are some new additions to Jardin des Tuileries, but sadly they won’t be here to stay for long. It’s all in preparation for the FIAC 2011 contemporary art fair which will be running this weekend. And what’s nice about these outdoor exhibits (as opposed to those inside various museum spaces) is they’re free for all to enjoy! While some pieces are still currently in construction (e.g. 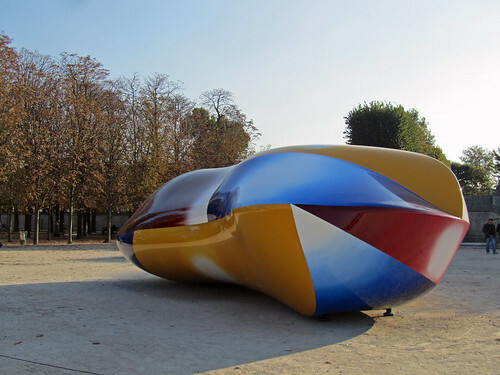 there’s a strange artichoke-like looking sculpture nearby), Moulène’s piece called Body (apparently inspired by Renault Twizy Z.E.) is already sitting pretty. With its striking colours, it’s quite hard to miss really. I’m going to make a round and see what else will be put in place.